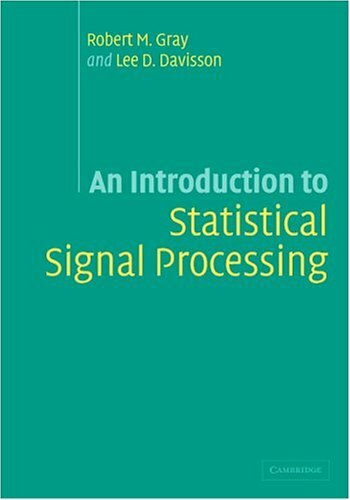 This book describes the essential tools and techniques of statistical signal processing. At every stage theoretical ideas are linked to specific applications in communications and signal processing. The book begins with a development of basic probability, random objects, expectation, and second order moment theory followed by a wide variety of examples of the most popular random process models and their basic uses and properties. Specific applications to the analysis of random signals and systems for communicating, estimating, detecting, modulating, and other processing of signals are interspersed throughout the book. The specific topics we will cover include: physical properties of the source information, devices for information capture, digitization, compression, digital signal representation, digital signal processing and network communication. This book reviews fundamental concepts underlying the use of concise models for signal processing. Topics are presented from a geometric perspective and include low-dimensional linear, sparse, and manifold-based signal models, approximation, etc. by H. V. Poor, G. W. Wornell - Prentice-Hall, Inc.
A valuable reference both for signal processing specialists seeking to apply their expertise in the rapidly growing wireless communications field, and for communications specialists eager to exploit signal processing techniques. The book provides a review on recent advances in Fourier transforms as the most powerful analytical tool for applications in electronic and computer engineering, as well as spectral techniques with a wide range of nanotechnological applications.